04-18-2000 Steve Thomas, "JonBenet, Inside the Ramsey Murder Investigation"
"Another reason to interview the Barnhills, however, was that Joe had told the police he had seen JonBenet's older half-brother, John Andrew, in Boulder on the evening of December 25. John Andrew claimed to have been in Atlanta at the time. During the interview Barnhill sheepishly told us he had made a mistake and apologized, saying that he probably would not even recognize the young man in a crowd. That went a long way toward firming up John Andrew's alibi." Tom Haney: "What I would like to do then is just have you walk us through and maybe first, of all, just in your own words again, if you could tell us from the time that, you got up on the 26th of December..."
Patsy Ramsey: "Okay. I awakened that morning, probably somewhere between 5:30 and six. We are going to take off for the airport just at seven, we were going to the lake house. I got up and walked over... to my bathroom... and I did not take a shower that morning, so I don't know, you know, what exactly I did... other than just get dressed, brush my teeth, put on my make-up, and get ready to go." "And then I walked down downstairs... came to the landing... and there was an ironing board... I had a plastic bag... that I had just things to throw, throw in, to take for my trip. And I think I was here for a couple of minutes, just getting some clothes, things." "And then I started down the stairs, this (spiral) staircase, to go to the kitchen. 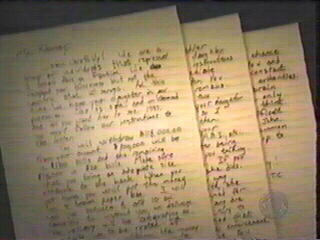 And the note was on the landing, on the stairs, the bottom of the stair... there was some lighting on, but it wasn't bright lights and (I) started reading the letter." "And after the first couple of sentences realized you know, what was happening, and I ran back up these stairs, okay, and pushed her door to her room... and she was not in her bed. So I went over to these stairs and yelled out for John, called to him and he came down. And I said, 'She's been kidnapped, here's a note," whatever and I was panicking, you know. I think - I can't remember exactly what I did then, whether - I think I ran downstairs again." "I said, you know, 'What do we do, what do we do' He said, "Call 911, call the police." "I ran upstairs, and I think - I think - I - I can't remember if - I think asked him to check on Burke, one of us checked on Burke, and, I remember just seeing him at the phone, trying to - and then I looked down and John came down, .... and he kind of crouched on the floor, he was in his underwear, and read the papers on the floor right there, and you know, I was trying to get this 911 person to - it just seemed like it took forever, to drag through, you know, crazy by that time." "Anyway, got the message across, she said she would send somebody out, and oh, God in heaven. Oh, then I phone - called our friends, Mr. and Mrs. Fleet White and Mr. and Mrs. John Fernie, they live in Boulder. I think John went back up to get dressed." "And I called them and told them that she's been kidnapped, she is missing. And then I walked out... and opened the door, and started waiting for - front door - started waiting for the police to show up... and pretty soon a squad car came - you know, officer came up. And I remember thinking because it said somewhere in the note, if you do that, if you call somebody, that's not good. Blah, blah, blah. And I just remember thinking oh, my God, I hope they are not watching me. I mean, what if they were watching, if the policeman comes,, I mean all this was just rushing through my head." "Anyway, he came in and - and I was just rattled. I think John came in, and I think he kind of walked us over to this sun room... tried to calm us down and, you know, tried to explain what happened. And then they kind of took over." "I hear John turning on the water to his bathroom and realize that it is still dark. As we always do before departing for an early morning trip, John and I will get dressed before waking up the children. Just before we're ready to leave, we'll get the kids up. Sometimes we even load them in the car in their pj's so they can resume sleeping in the airplane. Slowly the normal routine for an early morning flight comes into focus. Take a shower, get dressed, get going. I swing out of bed and abruptly remember that my shower is still broken." "Don't need one this morning, I think to myself. Just put my clothes on. And, of course, my make-up. I remember my mother's words. Never leave the house without your makeup. Plus we are going to be with Melinda's fianc�e, Stewart, so I want to make a good impression." "Got to be at the airport by 6:30 or so. Going to push us to get everyone going because time is so short. I reach for my clothes and start dressing." "Minutes later I hurry down the back stairs from our bedroom to the second floor, where the children's bedrooms are located. I stop at the top of the spiral stairs that lead down to the first floor, and I turn to the laundry area." "Need to get a few things together for the trip, I think to myself. Not much, since we've already got clothes and most necessary items at the house in Charlevoix. I quickly shove some of the laundry into a plastic garbage sack that will go on the airplane as-is. John likes us to pack in soft sided bags because it makes loading the plane easier. I hurry down the spiral staircase to the bottom floor and stop." Tom Haney: "So now we are on the second floor, because you're coming down the stairs?" Patsy Ramsey: "Right, I am coming down...I had the ironing board somewhere here. And I had - I think I had a couple of plastic bags here somewhere... to take to the lake." Tom Haney: "...And you stopped there?" Patsy Ramsey: "Just momentary. I remember - remember laying the little red jumpsuit of JonBenet's over the ironing board, because it had a few spots on it, so I was thinking when I came back from the lake I was going to take that to the dry cleaners, and decided to lay that under there somewhere." Tom Haney: "Was that - it wasn't something you were going to take to the lake?" Patsy Ramsey: "No, no, it was something she had worn for a Christmas performance. It was a little Christmas thing." Tom Haney: "When had she worn that?" Patsy Ramsey: "She had worn it - well, she wore it, some of her pageant girls performed together in a group, some Christmas songs and things, down in the mall in Denver, she wore it for that." Trip DeMuth: "Is that Amerikids?" Patsy Ramsey: "Yes, that's what, who it was, yes.... I had laid that out or done something and the light was on here." Tom Haney: "The laundry room light was on here?" Patsy Ramsey: "The light here. Yes, I was working there"
Tom Haney: "Okay, did you turn it on?" Patsy Ramsey: "I don't remember. That could have been one that was left on, I don't know. Sometimes we leave that one on." Tom Haney: "Sometimes you do?" Tom Haney: "But you don't recall that morning coming down into the dark or - "
Tom Haney: "So to best of your recollection, it was on, you think?" Patsy Ramsey: "I would say either that light was on or there were also some sconces right here on the stairwell, which were dimmed and oftentimes we would leave that on, because it was dimly lit as a nightlight sort of lighting area...so something I am sure was on, because it wasn't pitch black walking down." DOI (HB) Page 11: "What is this? I wonder." "I turn around to look at the three pieces of paper on a step near the bottom. I bend over. Must be a note from the cleaning lady, Linda, I think. Probably reminding me that she needs to borrow twenty-five hundred dollars. I must leave a check on the kitchen counter before we leave." "Mr. Ramsey. the note is addressed across the top. I look again more closely. "Listen carefully! My eyes fly across the top lines. At this time we have your daughter in our possession. She is safe and unharmed and if you want her to see 1997, you must follow our instructions to the letter. I quickly scan the page, $118,000, the killer demands." "I gasp for air. For a moment my heart pounds so I can barely move. 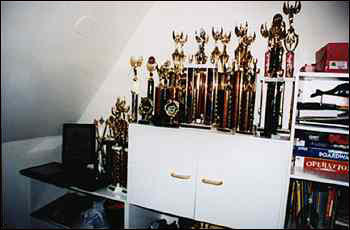 I race back up the stairs and stumble toward JonBenet's bedroom, pushing the door wide open. The bed is empty! J-o-h-nnn! J-o-h-nnn! Help?" I scream, "JonBenet's gone! He meets me wearing only his underwear." "There's a note downstairs." I can bearly speak. "Someone has taken JonBenet." I feel the blood rushing from my head. For a moment I feel like fainting. "She's gone!" I cry. "JonBenet is gone!" My stomach wrenches." 2000 March 18 John and Patsy Ramsey book, "Death of Innocence"
"For the first time I am aware that I have been racing around the house in my underwear. I hurry back to the third floor bedroom to grab my clothes. 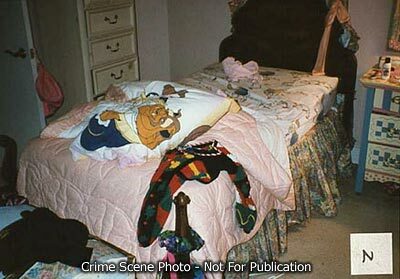 I stop in JonBenet's room and look under the bed to make sure she isn't there." "Standing alone in the bedroom, feeling as if I had been kicked in the stomach by a Clydesdale horse, I wring my hands in anguish and stare at the wall. I force myself to get my wits about me"
"I put on pants and a shirt, and hurry back downstairs." 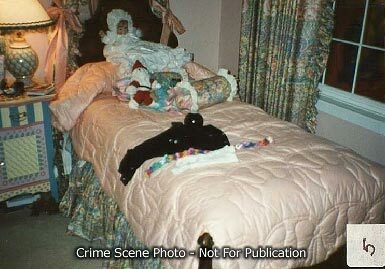 2000 March 18 - John and Patsy Ramsey book, "Death of Innocence"
"During the interview, photographs of JonBenet's bedroom were shown to me, and I saw a red-and-white stuffed bear in a Santa suit lying on an adjacent twin bed. I said I didn't remember seeing that bear before. My comments started a nationwide search for the bear." "I found it difficult to look at many of the pictures: I could see little things that evoked memories. The detectives pointed to some circles on her bedroom carpet, wondering what they were. 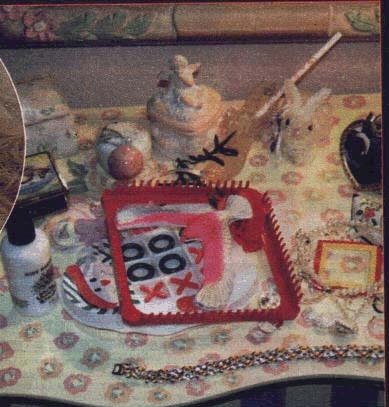 The potholder frame wasn't there, but I could tell the circles were cloth rings that JonBenet would weave into potholders. They showed me a picture of JonBenet's blanket and wanted to know if it was hers. The blanket looked pink in the picture, so I told them no. Her blanket was white. That's just the tint of the photograph, they assured me." Larry King: "But you were in Georgia. Why you?" Pam Paugh: "Well, that's a good question. However -- of course we were visiting in the home a lot, and so, yes, my DNA could be on -- I don't know how long DNA lives, and maybe Dr. Lee can answer that, but for instance, I could have a piece of hair fiber, maybe, on the nightstand or something, because I would often sleep in the other twin bed in JonBenet's room." "Both of us race to Burke's room at the far end of the second floor and find him apparently still sleep. Best not to arouse him until we figure out what's happening here, I think. He's better off asleep for now. I step into the hall." Patsy Ramsey: "I didn't -- I couldn't read the whole thing I -- I just gotten up. We were on our -- it was the day after Christmas, and we were going to go visiting, and it was quite early in the morning, and I had got dressed and was on my way to the kitchen to make some coffee, and we have a back staircase from the bedroom areas, and I always come down that staircase, and I am usually the first one down. And the note was lying across the -- three pages -- across the run of one of the stair treads, and it was kind of dimly lit." "It was just very early in the morning, and I started to read it, and it was addressed to John. It said "Mr. Ramsey," And it said, "we have your daughter." And I -- you know, it just was -- it just wasn't registering, and I -- I may have gotten through another sentence. I can't - "we have your daughter." and I don't know if I got any further than that. And I immediately ran back upstairs and pushed open her door, and she was not in her bed, and I screamed for John." Patsy Ramsey: "Okay, Um, we got up at about 5:30, I think, I think he went to the bathroom and shower. I went to my bathroom. I did not shower that morning and I just put my clothes on and, uh, did my hair and makeup and, uh, and then I started down the stairs. John was still in the bathroom and went, uh, I stopped kind of briefly there in the laundry room area. And I remember the ironing board was up, I think, and I fussed around with this little red jumpsuit of JonBenet's cause it had, had some spots on it and I was going to remember to do something with that when I got back and, uh, so I had, I had the light on in there in the laundry room area and, uh, um, then I started down the spiral staircase there. I came, I had come back down, I'd come down the back bedroom stairs..."
Patsy Ramsey: "....from my bathroom. Um, I started down the spiral stairs and when I got nearly to the bottom I saw these three pieces of paper, like notebook-size paper, on, on the run of the stairs and, uh, I went on down and turned around and started reading, reading it...."
Patsy Ramsey: "And I, uh, I remember reading the first couple of lines and I kind of, didn't know what it was on, uh, and ...You know after the first couple of lines I, it dawned on me, it said something about, 'We have your daughter' or something....and I, uh, I ran back upstairs and pushed open the door to her room and she wasn't in her bed." Patsy Ramsey: "And I, uh, screamed for John." Tom Trujillo: "Patsy, let me back you up just a little bit. Um, actually to the, to the very beginning of the morning. You and John wake up ... Did you have an alarm clock set or anything?" Patsy Ramsey: "Uh, I think he had it set, but I don't think it went off. I think we woke up about, you know, I don't remember it going off or anything." Tom Trujillo: "You don't have an alarm that was set on your side of the bed at all?" Tom Trujillo: "Okay. Got up, got dressed. Do you remember what you wore that morning?" Patsy Ramsey: "Black velvet pants and my red sweater." Tom Trujillo: "Okay. Now you went downstairs. When you stopped there at the laundry room...."
Patsy Ramsey: "The laundry room." Tom Trujillo: "You stopped at the ironing board and laundry area. 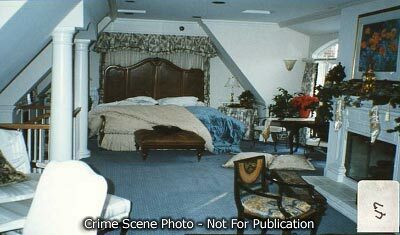 Was JonBenet's room, do you remember if the door was opened or closed at that point in time?" Patsy Ramsey: "It was, it didn't strike me as unusual, you know, I...."
Patsy Ramsey: "....And I think it was open just a little bit like I would have left it." Tom Trujillo: "Okay. And that's, that's kind of normally how she sleeps with the door kind of....?" Patsy Ramsey: "A little bit open"
Tom Trujillo: "Just a little bit open"
Patsy Ramsey: "Cause I usually leave a light on in that hallway area there. 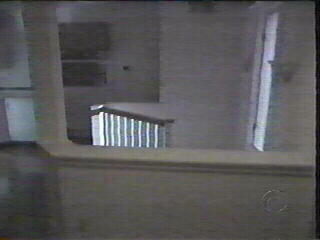 Either the stair sconces or the, there's a light in where the washing machine is...right there, you know"
Tom Trujillo: "Do you remember with the door being open just a little ways, of there being any lights on in JonBenet's room?" Patsy Ramsey: "I don't remember"
Tom Trujillo: "Don't remember whether there was anything that was illuminating out of that room?" Patsy Ramsey: "Now her, her main light was not on, you know her lamp was not....."
Tom Trujillo: "Right around the corner. Okay. When did you check on Burke during all of this? You talked about John going to check on Burke." Patsy Ramsey: "Yeah, I think he ran and checked on him when I was up, up there, you know, it just all happened so fast. I said, 'Oh, my God, what about Burke?' and I think he ran in and checked him while I was running back downstairs or something. But I remember he, you know, I think he ran and checked on him and, and he told me he was okay or whatever." Lou Smit: "Okay. You wake up the next morning...what time do you remember it being?" John Ramsey: "Well, I think we set the alarm for 5:30. I remember waking up before the alarm went off. So it would have been 5:25 or something like that...we wanted to take off at 7. It was a three-hour flight to Minneapolis. That would have gotten us there at 11 (because of different time zones). The kids' flight got in at eleven-ish...I didn't want to be late for the kids' plane...."
Lou Smit: "What is the first thing upon awaking...?" John Ramsey: "I think I went into the bathroom, probably went to the bathroom, took a shower. Just started to get dressed...I remember I was standing at my sink and I was probably brushing my teeth or combing my hair or something and I heard Patsy scream." Lou Smit: "You know about what time it was that you heard her scream?" John Ramsey: "It would have probably been between 5:30 and 6:00..."
Lou Smit: "Did you see your wife get up that morning?" Lou Smit: "So you had already been in the bathroom when she got up?" 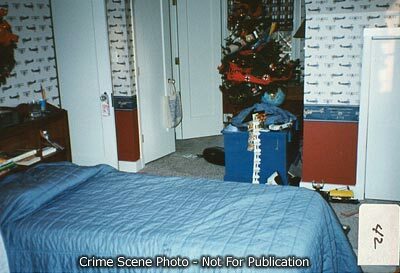 Tom Haney: "How about JonBenet's room, what was the condition of the room? Patsy Ramsey: "Well, I remember racing over and her door was just kind of slightly ajar.. three, four inches, you know." Tom Haney: "Okay. Is that the way you left it the night before?" Patsy Ramsey: "Yes, that's usually the way I left it." Tom Haney: "And is there a particular reason?" Patsy Ramsey: "Well, I closed it because if I did leave a light on out here, it would shine pretty brightly into her room so I closed to make it a little darker in there. But I want to leave it so if she needed me or called out or something I could hear her, you know." Tom Haney: "So that was the normal thing?" Patsy Ramsey: "That was the normal thing to do." Tom Haney: "Did you happen to look in?" Patsy Ramsey: "No. At that time, I did not." Tom Haney: "Did you happen to notice if there was any light coming from inside?" Patsy Ramsey: "I didn't notice. Just nothing seemed unusual." Tom Haney: "Okay. So we are still at the ironing board and this little red outfit. What do you do with that, how long does that take?" Patsy Ramsey: "Just, I don't know, just a few minutes. And I don't know, I can't remember what I was doing. 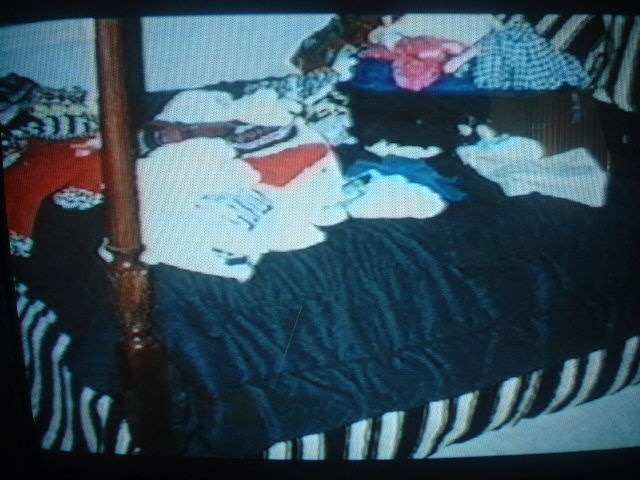 I just remember I was trying to get this bag ready to go to the lake, I had two suitcases... of the children's things. I was trying to get ready, because when we came back from the lake we were going on to Disney and the Big Red Boat." Patsy Ramsey: "I started down the stairs, the staircase to the kitchen and the note was on the landing, on the stairs, on the bottom of the stairs (pointing at floor plan), and I.... there was some lighting on, but it wasn't bright lights.....and looked you know, read, started reading the letter. And after the first couple sentences realized, you know, what was happening and I ran back up these spiral stairs, okay and I came and pushed open her door to her room right here (pointing at a floor plan) and she's not in her bed and then I went over to these stairs (pointing at a floor plan) and yelled up for John, call to him and he came down and then I said, you know, she's been kidnaped, she's not in her room, there's a note, whatever, and ah (pause) it was a panicking at that point. Ah, I think I, I can't remember exactly what I did then, whether, I think I ran downstairs again, you know, what do we do, what do we do, and he said call 911, call the police. I ran upstairs and I think he, I think I, I can't remember if, I think I asked him to go run and check on Burke." Man: The following morning, Dec. 26th, the Ramseys got out of bed early in their third floor bedroom. They were due to take off to the local airport at half past seven. 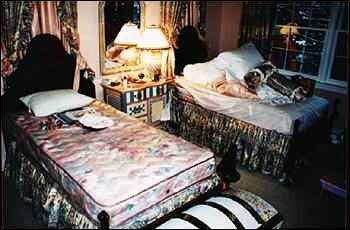 Patsy Ramsey says she went downstairs at about 5:30 to put together clothes for the trip from the laundry cupboard just outside JonBenet's bedroom." Patsy Ramsey: "I was fussing around getting some clothes and glanced at her door and the door was closed. I always left it ajar a little bit. I just started downstairs and there were these pieces of paper lying on one of the rungs of the stairs. I kind of turned around and looked at it to see what it was and I started reading the first couple of lines. It just wasn't registering but somewhere it said, 'we have your daughter' it clicked, you know, 'Your Daughter' and I just bounded back up the steps and threw her door open and she was not in her bed." Patsy: And at this time I remember screaming to John, he was still upstairs dressing." John Ramsey: "I knew something was very wrong. I came down and she had the note and I read it quickly trying to take everything in. I screamed." Patsy Ramsey: "We don't know what to do - I mean, what do you do? You know you just don't know what to do - What do I do? You're just panicked." John Ramsey: "You don't know where to start." Patsy Ramsey: "You just can't think fast enough." John Ramsey: "That was the worst moment. Suddenly realizing that someone had your daughter, your child, someone has taken her, she's gone and we didn't know where she was and it was dark, it was cold outside." Man: "The ransom note said, speaking to anyone about your situation such as the police, FBI etc., will result in your daughter being beheaded. If you talk to a stray dog, she dies. But the Ramseys did call the police. Police reports from that morning show the uniformed police who came were suspicious from the start. 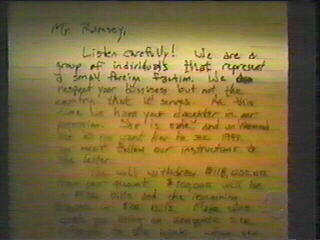 But by then the Ramseys were already raising the ransom, an odd amount, just $118,000." Peter Boyles: "Why did you think that?" Linda Wilcox: "Gut feeling more than anything. But even now, more than then, I would (garbled) on everything I have that a stranger did not kill JonBenet. The lay of the house doesn't... it would be very difficult. Possibly, there are people who are professional. But then they would have done a professional job. Lots of little things contribute to my belief. Someone who didn't know that house, really well, couldn't have done what they done (sic) without being noticed. It's not possible. It is physically impossible. You had to know little things. Like for example, you walk in the room and hit the switch, the light doesn't come on. See, cause when the room was redone, they put in a ceiling fan, one of the metal ones, without a light kit on it. The only light in her room was the lamp between the two beds. You have to physically walk over and turn it on. It isn't run by the switch. 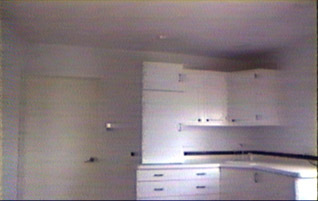 The switch was meant to run the overhead ceiling light which was removed to install the ceiling fan." Pam Paugh: "The last time I saw JonBenet was over the Thanksgiving holiday. She had traveled here, not only to be with family for that holiday, but also to attend a small passage here in the Georgia area, representing Colorado." "At about midnight, Scott Gibbons, a neighbor, looked out his kitchen window toward the Ramseys' house and saw a light on in the kitchen area. Sometime later, Adam Fermeire, another neighbor, who was up watching TV, said he didn't notice anything strange through the window that faced the Ramseys' house." "Diane Brumfitt, another neighbor, told Detective Barry Hartkopp on December 31 that on Christmas night she did not see a light on at the southeast corner of the Ramseys' house, though there had been a safety light in that spot for years. She remembered thinking that it was unusual. Melody Stanton, up the street at 738, told the police on January 3 that she was certain she had heard a child's scream at about 2:00 A.M. on the night of the murder. Her bedroom window, which looks toward the Ramsey house from across the street, had been partly open. When questioned by the police, Stanton said that there had been only one scream but it was horrifying. If it came from the child, she assumed the scream had awakened her parents." Patsy Ramsey: "And as I came to the bottom of the stairs there were three pages neatly laid across one of the rungs of the stairway. I turned around to start to see what it was and realized after I'd read the first couple of lines." Barbara Walters: "It was a ransom note." Patsy Ramsey: "Yes it was." Patsy Ramsey: "I believe it said 'listen carefully.' Something like, 'We have your daughter.' And I just dashed back up those stairs as fast as I could and pushed her door open and she wasn't in her bed." Patsy Ramsey: "Then I just screamed for John. Screamed." John Ramsey: "I knew from Patsy's tone of voice that something was very wrong. And I rushed downstairs and she told me there was a note and I read it." "And after the Barnhills' dogs died, they really grew attached to Jacques. He probably spent as much time at their house as he did at ours. 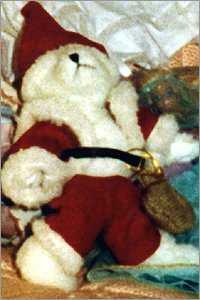 They had agreed to baby-sit him while we were in Charlevoix that Christmas." COURIC: The next morning, John and Patsy woke up around 5:30 to get ready for a family trip to their home in Charlevoix, Michigan. What did you do when you woke up? Ms. RAMSEY: Just hustled around, and got dressed, and pulled on the clothes I'd had on the day before, and quickly got ready, went down to the--our--our bedroom is on the third floor. Went down to the second floor, and I looked at JonBenet's door and noticed that it was just seemingly the way I'd left it, you know, the night before. So I headed on down the spiral staircase toward the kitchen. And as I got near to the bottom of the stair, I saw three pieces of paper laid out neatly on the stairway there. COURIC: Next to each other? Ms. RAMSEY: Yes, mm-hmm. And I began to read--read the note, and first, didn't really understand what it was, or--but soon, it came to the part where it said, 'We have your daughter.' And I just, you know, was horror--horrified. And I went running back up the stairs as fast as I could and pushed her door open, and she wasn't in her bed. COURIC: ...Christmas day the next morning. Some people have said that's strange. COURIC: She got up, she put makeup on, and yet, when she got dressed, she grabbed the same clothes. Maybe that means she was up all night. Ms. RAMSEY: If you would talk to any number of my friends, they'd confirm that I wear the same thing several days in a row sometimes. It was really not anything out of the ordinary. COURIC: Another point I just want to clarify. Apparently, it's been reported that you've given two different versions of when you actually looked in at JonBenet. One, that you looked in on her before you saw the ransom note. "While Reichenbach drove to the house, Mrs. Ramsey was telling Officer French that she had gone into JonBenet's bedroom at 5:45 A.M. to awaken her daughter because the family planned to fly to Michigan that morning. The bedroom was empty, and when she decended a spiral staircase, she found the note on the lower rung. John Ramsey said he had checked the house, and it appeared to still be locked as he had left it the night before. He saw no signs of forced entry or a struggle. The alarm system had not been engaged, their small dog had spent the night at a neighbor's home, and the Ramseys had heard nothing unusual during the night." "It soon became clear that Patsy Ramsey had changed a very important part of her story and that her statements about her initial movements were inconsistant. It raised some doubts when investigators compared their notes. 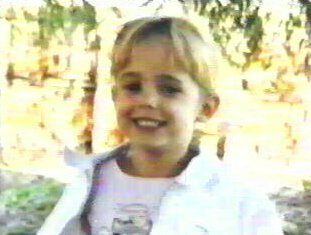 She originally told Officer French that she checked the bedroom before finding the note on the stairs, but she later told Detective Arndt that she went downstairs and found the note first and only then hurried to the bedroom and found JonBenet gone." "An equally important point, made by John Ramsey, was repeated to three different officers. He told French, Arndt, and later Sergeant Whitson that he had personally checked the doors the previous night and all were secure. When three cops get the same information during separate conversations with the same person, I view it as a consistant story. Months later, in an official interview, Ramsey would deny saying it to any of them." "Patsy also told officers she thought the house was locked when they went to bed. No keys had been lost or stolen, John Ramsey told both French and Arndt, and the only people who had keys other than the immediate family were Patsy's mother and his oldest son, both of whom were out of state, and the housekeeper, Linda Hoffmann-Pugh." 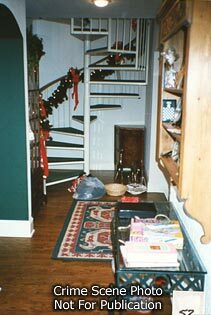 Lou Smit: "Whether or not the note was written in this alcove or not we don't know, but we do know that the ransom note was found on the bottom step of this spiral staircase. From here it�s only a short distance to JonBen�t's room. This is JonBen�t's bedroom but the door right next to it is the guest bedroom and there was a real interesting thing that we found out about this room. This window overlooks the garage and the driveway and would be a great vantage point for anyone that would want to see if the Ramseys were coming home that night. 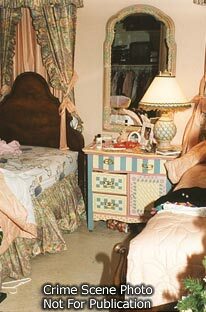 What's interesting about this room - we did see that some of the drawers in the bathroom right off the bedroom were partially open - looked like they were out of place. Also in this room there was a rope and we don't know where that rope came from. No one can explain why that rope is in this room. Also what was real interesting in this room, and it's just a small detail, is that there was a dust ruffle that was tucked in except for just a small area that seems to have been pulled out. 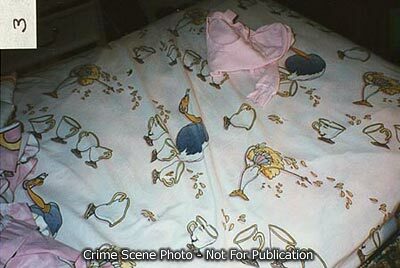 Now does that mean that the killer may have been under that bed, we just don't know. But it�s just an observation. One of the small things that detectives look for. He could have been under there and it would be a perfect vantage point for him to go right in JonBen�t's bedroom in order to take her out later." "While the house search went on, other cops fanned out to canvass the neighborhood and conduct more interviews. A resident directly to the south reported that the light was off in the southeast corner sunroom of the Ramsey home and thought that was odd because it was the only time she was aware in th3e past few years that it did not burn all night. A neighbor to the north would say that the butler kitchen lights were on around midnight and considered that unsual since it was the first time he had noticed that light being on in the Ramsey home. A third neighbor, to the west, said that her dogs, who barked at anyone walking in the alley, just as they did when the police officer came to question her, made no noise Wednesday night." 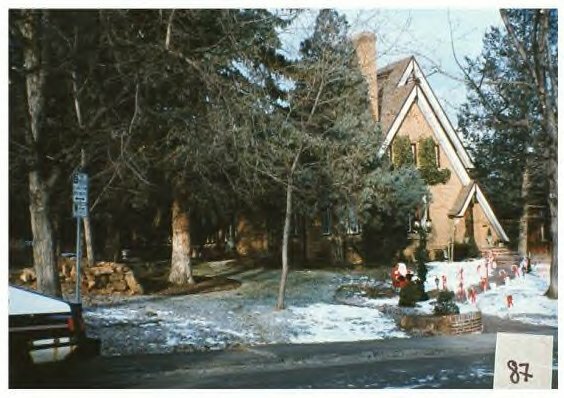 "In a few days another neighbor, Melody Stanton, who lived at 738 Fiftheenth Street, diagonally across from the Ramsey home, also changed her original story, which was that she had not noticed anything unusal on the night JonBenet died. When a detective interviewed her a second time, Stanton admitted that she had not told the truth earlier because she did not want to be involved in the case. She now claimed to have heard the piercing scream of a child between midnight and two o'clock in the morning of December 26." "If that cry came from JonBenet, it would help determine the time of death. If a neighbor clear across the street heard the scream, I wondered how anybody in the house could not have heard it." "Her story, which seemed to be a clear piece of evidence, contained its own seed of destruction, however. More than a year later we would discover that Stanton also told the detective, 'It may not have been an audible scream but rather the negative energy radiating from JonBenet.'" "The detective returned to that odd point several times during the interview, but Stanton never again mentioned the 'negative energy.' She insisted that she heard an audible scream, so the detective did not include the 'negative energy' comment in his report. "A year later he was ordered to write an amended report. Changing a report is a huge issue for police since it brings the validity of the entire statement into question. His revised report was not the first, and it would not be the last, that would enter the Ramsey case file." "Soon after Smit was hired we went out for a cup of coffee, and he told me one of his personal commandments; 'Murders are usually what they seem. Rarely are they perfectly planned,' he said. He was cautious and noncommittal, which I considered prudent, since he had not yet had a chance to read the thousands of pages in the file. He spoke at length about the Heather Dawn Church, as if the murder of this little girl might be the blueprint for this case too." "Three days later at a detective briefing, Smit made his first appearance, greeting us all and taking a seat along the west wall. We went around the table to update our findings. Finally it was his turn. He had been around only about seventy-two hours, not anywhere near long enough to devour the case material, but we hoped he might have some initial insights. He did." "Lou shifted the toothpick to a corner of his mouth, and his eyes twinkled with the excitement of a good bird dog on point. He said, "I don't think it was the Ramseys." "He never budged from that position."